Like a number of company names in the U.S. firearms industry, the Auto-Ordnance name has been around for a comparatively long time. Some of the names are simply old names bought up and slapped on new, recently-created companies. Others are old names whose companies essentially went belly up and the name has been brought back in front of a new company. A relatively few of the more famous names have actually been in existence since the founding of the companies. One of these is Auto-Ordnance Corporation, makers of the famous Thompson (“Tommy Gun”) submachine gun. The Auto-Ordnance Corporation was founded by U.S. Army General (Retired) John T. Thompson. Aside from the submachine gun that bears his name, General Thompson’s name is also well-known to students of the M1911 as being one of the two principals behind the 1904Thompson-LaGarde study for the U.S. Ordnance Department that tested ammunition effectiveness against human cadavers and live cows. It was this study that generated the recommendation that any new sidearm adopted by the United States military “should have a caliber not less than .45.” Thus it was that, when Colt approached John M. Browning about designing a new, semi-automatic pistol for the military, it was a .45. But … I digress. Thompson retired from the military in the Fall of 1914 and went to work for the Remington Arms Company. Seeing the rise of trench warfare in Europe during WW1, Thompson became interested in the concept of a firearm that could sweep a trench and clear it of hostile personnel. His term for such a weapon was the “trench broom” (sometimes also called the “trench sweeper”), but the concept ultimately resulted in what we know today as the submachine gun: a fully automatic firearm firing a pistol-caliber cartridge and suitable for carry and use by a single soldier. Impressed with a design by a naval officer named John Blish, Thompson brought Blish in as a partner and founded the Auto-Ordnance Company. When the United States entered WW1, Thompson put Auto-Ordnance on hold and reentered the Army, eventually being promoted to Brigadier General. He retired for a second time in December of 1918 and went back to work perfecting the concept of a fully automatic, pistol caliber firearm for the Auto-Ordnance Company. After tests showed that the .30-06 military rifle cartridge was far too powerful for the operation of the proposed firearm, Thompson settled on the same .45 Automatic Colt Pistol cartridge that had resulted from his 1904 testing with LaGarde. The “Tommy Gun” was the result, and was patented in 1920. Arriving too late for the Great War, the Tommy Gun was sold to civilian law enforcement … and to gangsters. Nonetheless, sales were lower than expected. Financial backing for the company had been provided by a gentleman named Thomas Ryan. When Ryan died in 1928, his son sold the Auto-Ordnance Corporation to Maguire Industries. As a result of the sale, Thompson was forced out of his own company. Curiously, the Auto-Ordnance company itself appears to have produced only prototypes and short runs during this period. Larger runs of production for the Model 1921 were made by Colt and by Savage Arms. In WW2, Auto-Ordnance built its own production facilities in Bridgeport, Connecticut (which was also the location of a huge Remington manufacturing facility that has only recently been demolished). The weapon was adopted by the U.S. military in three versions, the M1928A1, the M1, and the M1A1. Initially issued to tank crews, it also found use in jungle warfare, where the short length and rapid rate of fire outweighed the lack of long range accuracy and terminal energy. 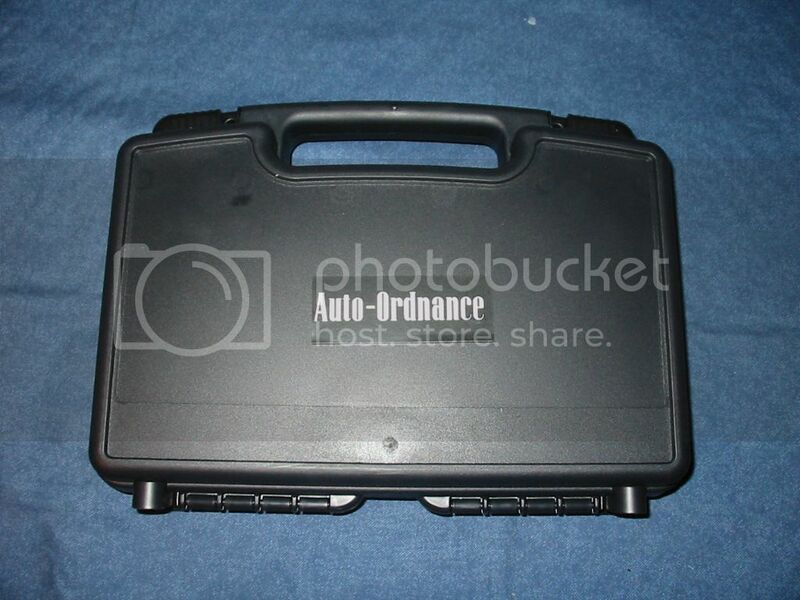 In 1951 Auto-Ordnance was purchased by the Numrich Corporation, and production was moved to New York. When new production of fully automatic firearms for the civilian market was made illegal, the Tommy Gun was modified to operate in semi-automatic mode and was sold as an accurate, functional replica of the famous submachine gun of a by-gone era. In 1999 Auto-Ordnance was purchased by Kahr Arms and production was moved to Kahr’s state-of-the-art facility in Worcester, Massachusetts. At the time of the purchase, in addition to three models of the “Tommy Gun,” Auto-Ordnance was producing a few GI-clone 1911s modeled after the WW2 M1911A1 but they were not producing a 1911 bearing the Thompson name. As most 1911 aficionados already know, 1911s produced by Auto-Ordnance under Numrich ownership were unreliable and subject to very haphazard quality control. Kahr did not purchase Auto-Ordnance for the 1911 line, but for the Thompson “Tommy Gun” line and for the Thompson name. 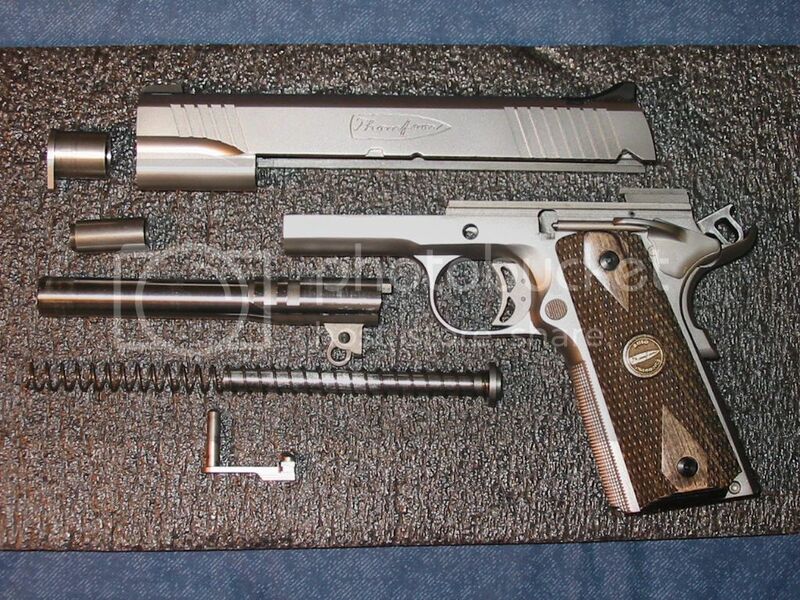 The 1911s simply came along as part of the package. Kahr immediately discovered that they could not produce saleable 1911s using the tooling they had received from Numrich. There are probably very few people today who have not at least heard of CNC (Computer Numeric Control) machining. Most firearms manufacturers today have adopted CNC machining, although the extent varies from one company to another. Where most 1911 manufacturers today are gun makers who have adopted CNC machining technology, by contrast Kahr Arms (the parent company of the current Auto-Ordnance) is a CNC technology company that diversified into the manufacture of firearms. By the time Kahr Arms acquired Auto-Ordnance and set out to retool the production of 1911s, there was essentially no learning curve whatsoever. They were able to “hit the ground running,” and the quality of 1911s produced by Auto-Ordnance under Kahr’s ownership has been head and shoulders above that achieved by Numrich. However, in their GI replica series pistols Auto-Ordnance by intention worked to the same tolerances established nearly a century earlier for the military M1911. Those tolerances result in firearms that are typically loose enough to function reliably under adverse conditions, but are not optimal for serious accuracy. A few years ago, the management at Auto-Ordnance decided to introduce a new 1911 pistol, with enhanced tolerances to better demonstrate their capabilities. The result is the Thompson TC pistol, named after the company’s founder. After a period of discussion with our contacts at Auto-Ordnance, M1911.ORG was finally able to arrange for a sample pistol to be made available to us for evaluation. This was no small effort. In discussions with the regional representative for Kahr Arms we learned that even he has never had access to one of these pistols for long enough to shoot it. They are comparatively rare in the marketplace. The Thompson TC arrived in a hard-side, molded plastic pistol case. Either Auto-Ordnance has changed their supplier since my colleague, Hunter Elliott, reviewed the Auto-Ordnance 1911A1 in 2007, or they feel that the Thompson TC is a different grade of firearm and deserves a higher quality case. Where the 1911A1 came in a simple case with an eggcrate foam liner and snap-fold latches, the Thompson TC case has the foam liner precision cut for the pistol, magazine, and cable lock. The two plastic latches are heavy duty, sliding affairs, each with a hole for a padlock. Inside the case, the pistol itself was enclosed in a plastic bag and was fairly wet with oil to protect it during shipping. In addition to the pistol we found a cable gun lock, a general instruction book for 1911s, a parts list, a warranty card, and an Auto-Ordnance brochure. 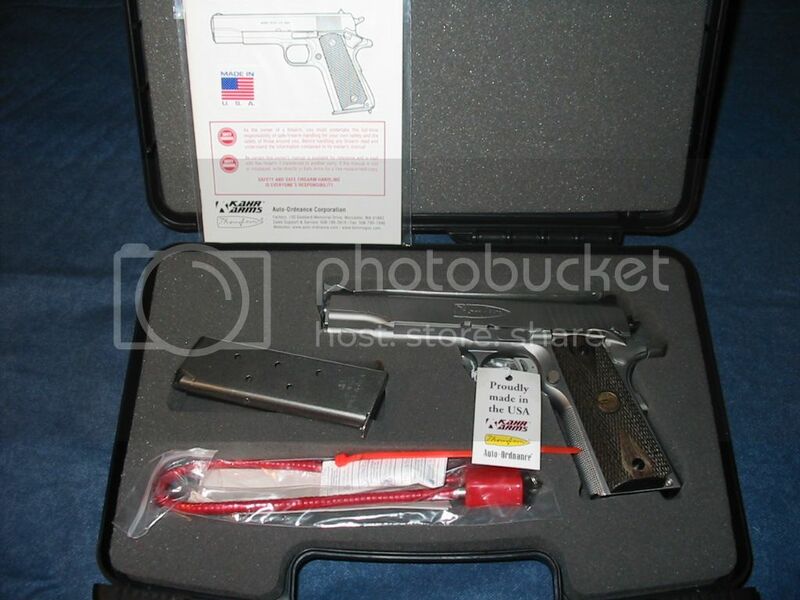 The test pistol arrived with one 7-round, stainless steel magazine, and the manufacturer’s literature and web site indicate that this is standard. We think the decision to ship only one magazine is unfortunate. The space in the case is deep enough to easily accommodate two magazines, and the first thing any new purchaser is going to do is look for additional magazines. One magazine is simply not enough in today’s world. We can understand selling an entry-level pistol with only one magazine, but not the company’s flagship model. 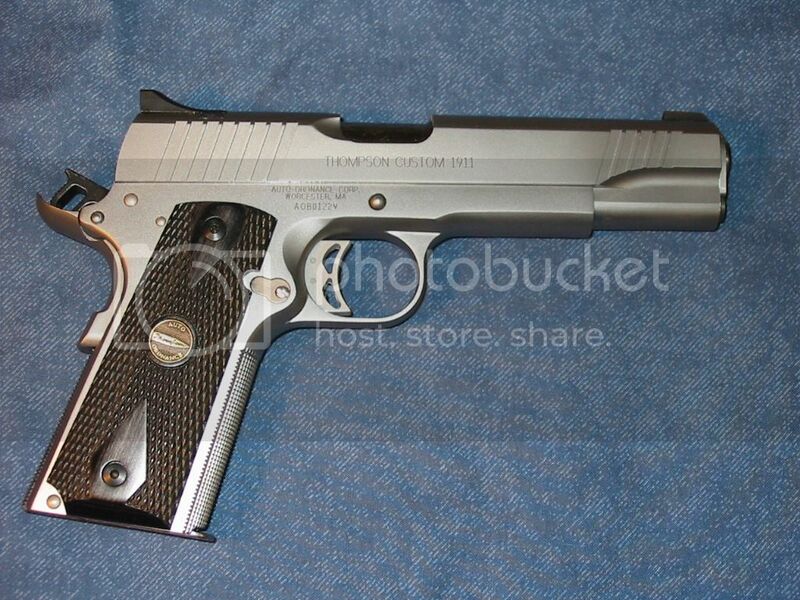 The Thompson TC is a full-size 1911 pistol, offered only in stainless steel. The finish is a smooth matte overall, not heavy enough to have any texture or grain but just enough to not be highly reflective. 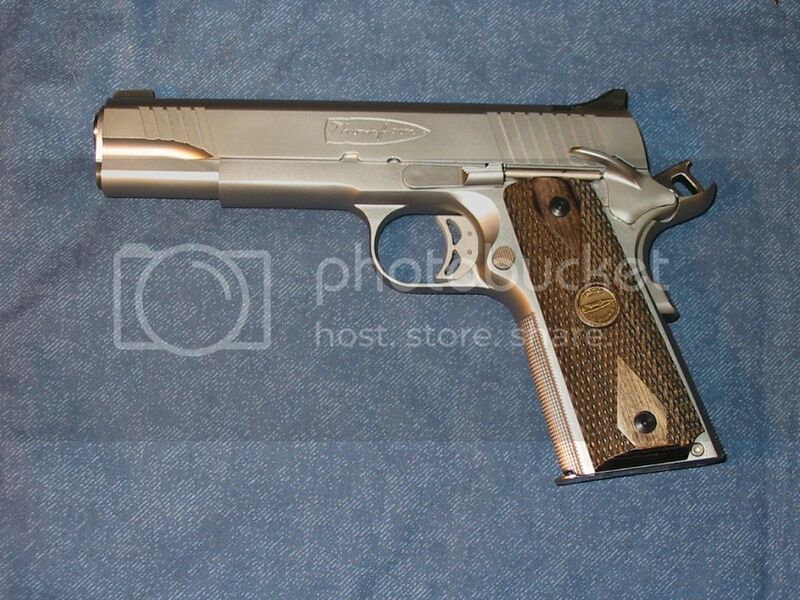 Grips are an attractive, dark, double diamond checkered wood with Auto-Ordnance medallions on each side. Although our regional representative for Auto-Ordnance assured us that the grips are Walnut, if so they must be Black Walnut because the color is so dark as to be almost black, and the color is the same on the back sides of the grips as on the outside where it’s visible. Whatever the material, the grips are well executed. Given our preference for the original, double diamond design used with the original M1911 at the time of its adoption by the U.S. Ordnance Department, we applaud the decision not to adorn the Thompson TC with any of the “design du jour” grip patterns available today from myriad different makers. 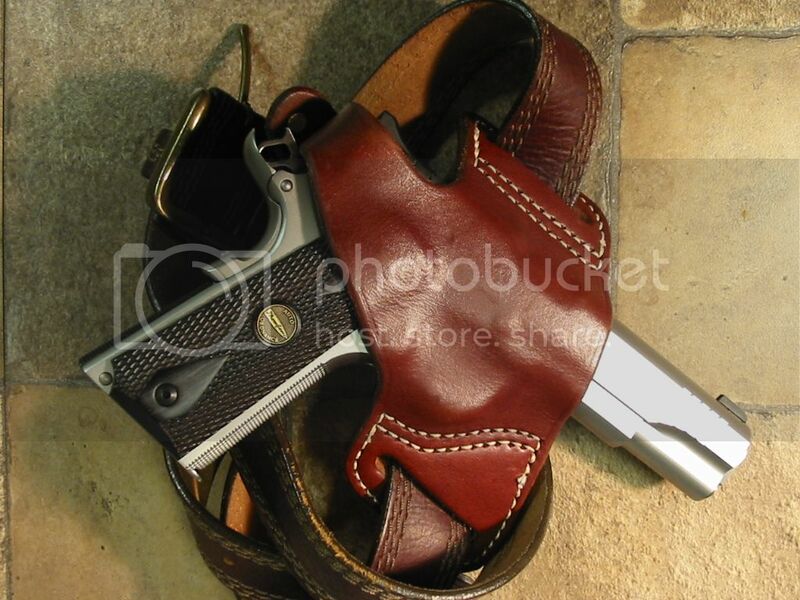 A classic pistol should come with classic grips, and the owner can change them out after purchase if desired. 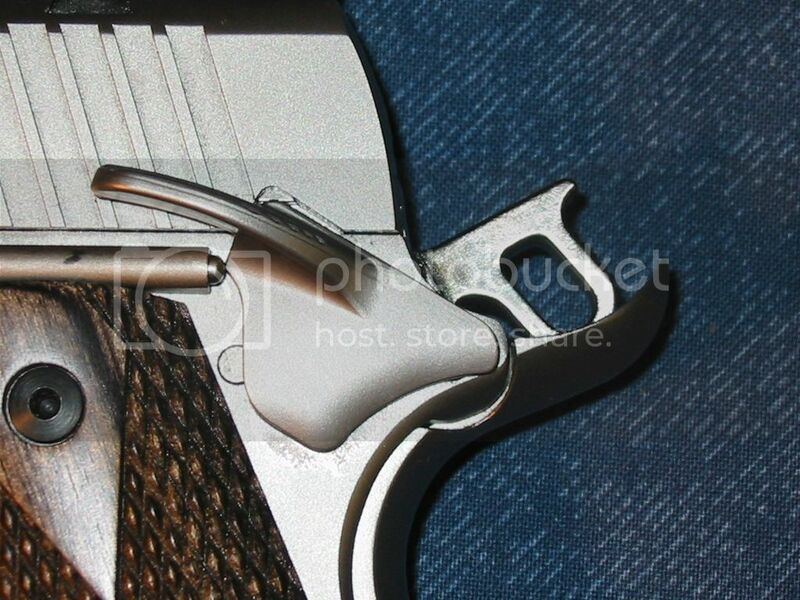 The slide is detailed with slanted cocking serrations front and rear. The serrations are essentially rectangular in cross section rather than vee-shaped, and provide a good grasp for racking the slide. 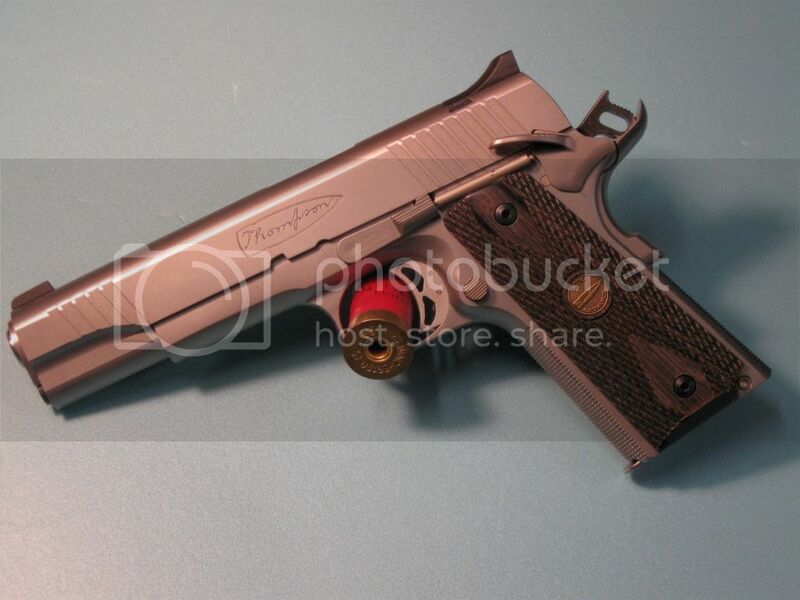 The author does not care for front cocking serrations but we recognize that many people seem to prefer them, and they have become almost de rigueur on high-level 1911s. In this, Auto-Ordnance is simply giving people what they want. The slide release is a standard configuration but the thumb safety is the extended style. A nice touch is that the rear edge of the thumb safety paddle is nicely blended so there’s no sharp edge to dig into the soft part of the shooter’s hand when firing. The Thompson TC is fitted with a beavertail grip safety with palm swell. The beavertail is well fitted to the receiver. The palm swell is just that—there are no “memory grooves” here to detract from the clean lines of the pistol. 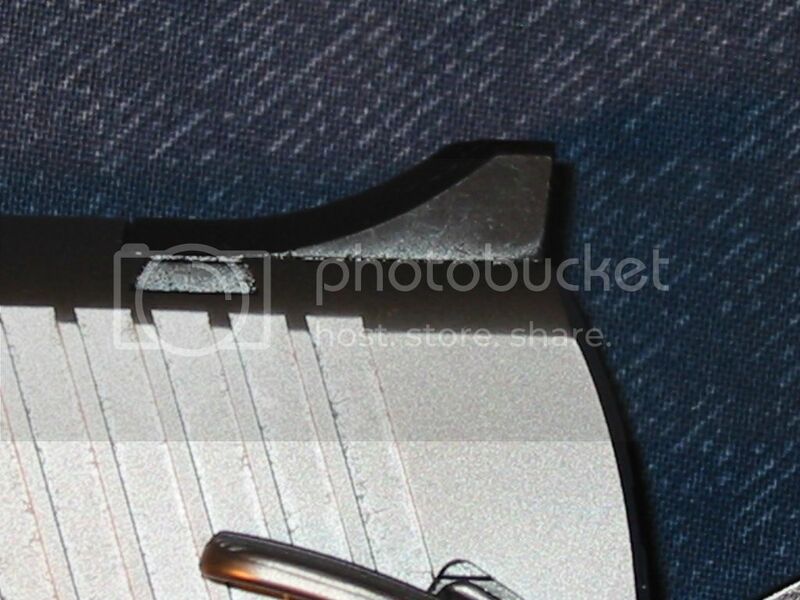 The front strap and the mainspring housing are nicely checkered. 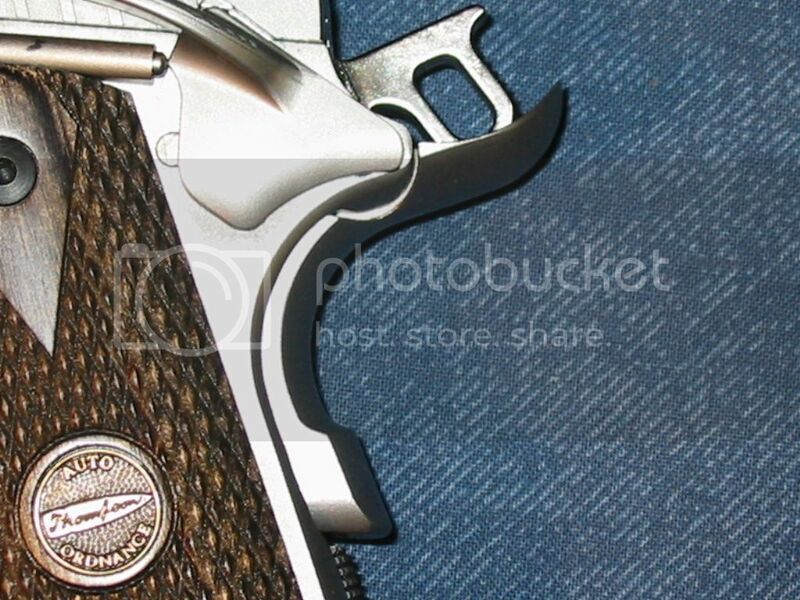 Although in general the author does not like front strap checkering and doesn’t believe it provides any significant benefit, it’s another of those “features” that most buyers have come to expect on an up-scale pistol, and Auto-Ordnance has simply responded to the marketplace by offering what most customers will probably want. 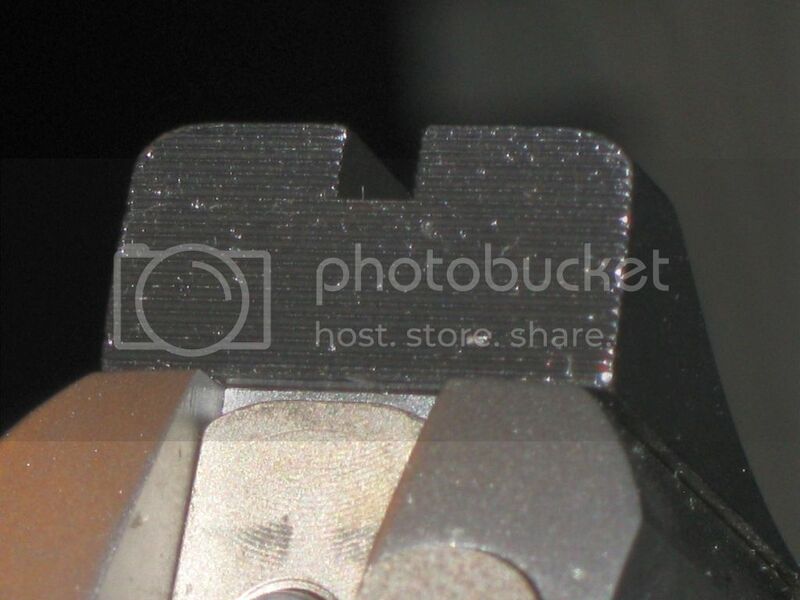 Front and rear sights are set in dovetails, with the front sight being a press fit and the rear being retained by a small, Allen-head set screw to facilitate lateral adjustment for windage. 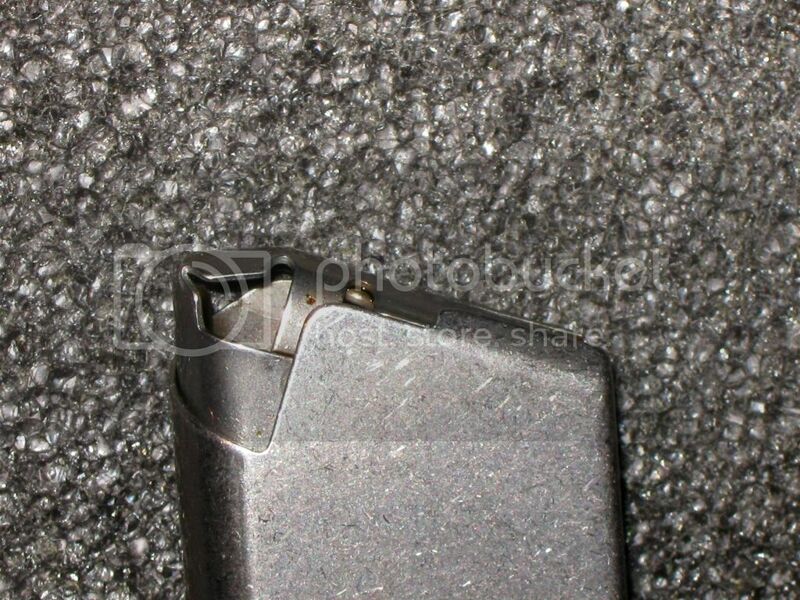 Both the front are rear sights are black, with no white dots or night sight inserts. 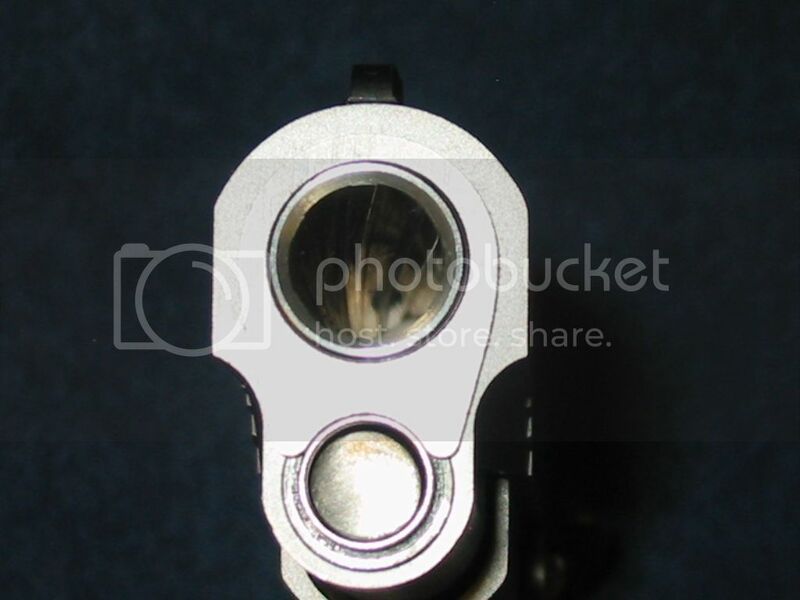 The rear faces of both the front and rear sights are serrated to reduce glare. The Thompson TC comes equipped with a one-piece, full-length recoil spring guide rod. As with some of the other features on the TC, the author does not favor the use of full-length guide rods but many people extol their (purported) virtues and many buyers apparently have come to expect them on higher-end pistols so, again, Auto-Ordnance is simply responding to the demands of the marketplace in supplying it. We applaud their decision to use a one-piece guide rod, because two-piece full-length guide rods have shown a propensity for unscrewing themselves in use. 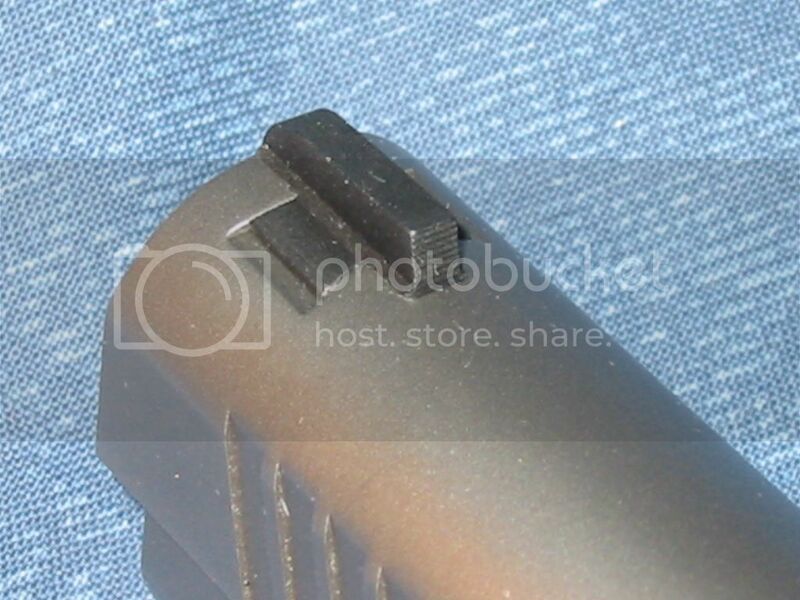 This, as can be imagined, is generally not “a good thing.” The recoil spring plug on the Thompson TC is configured such that the tip if the guide rod is recessed and the plug can be depressed with a bushing wrench and turned, so that field stripping can be accomplished in the conventional manner. 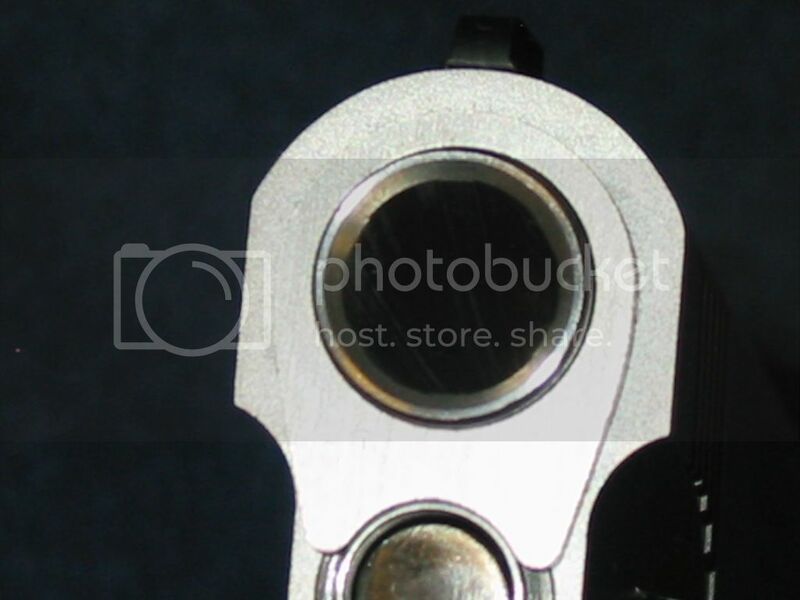 The muzzle itself is nicely crowned to protect the rifling. The guide rod is recessed in the open-front recoil spring plug, allowing for conventional field stripping. The Thompson TC uses a Colt-designed Series 80 firing pin safety system. For those not familiar with the nuances of these systems in 1911s, the Series 80 system uses a small finger lever activated by the trigger to lift a plunger in the slide to allow the firing pin to move forward. The purpose of a firing pin safety is to prevent accidental discharge in the event the pistol is accidentally dropped on its muzzle. Although this may not be a major concern for a pistol used only at the range, the author has been persuaded of the merits of a firing pin safety for any pistol that is carried for self-defense purposes. 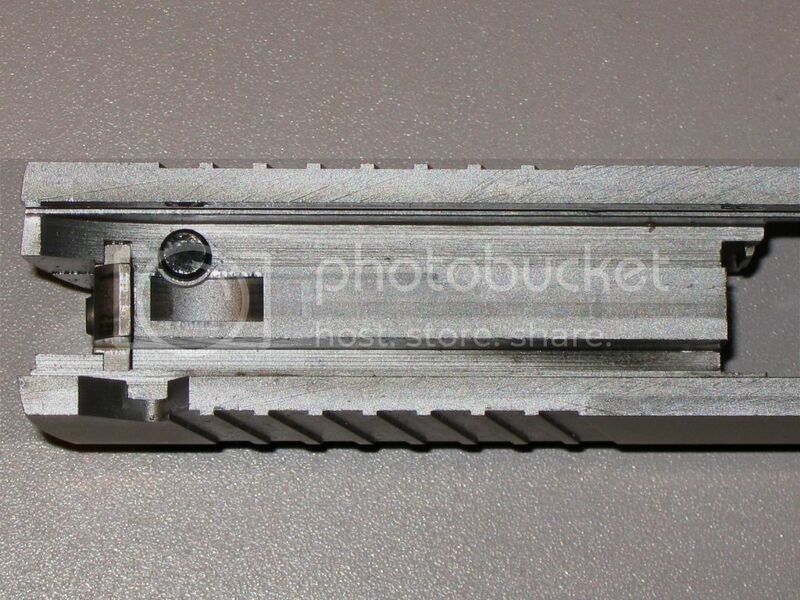 Underside of slide, showing the Series 80 firing pin safety plunger. Note the clean, chatter-free surface of the disconnector rail. Shooting off-hand at a distance of 25 feet, we first tried the Thompson TC using Winchester USA 230-grain FMJ ammunition, some of the author’s handloads (230-grain Berry’s plated, round-nose bullets over 5.4 grains of Winchester 231 in Winchester brass), and some Cor-Bon DPX 185-grain JHP ammunition. Each of these ammunition types functioned flawlessly through the Thompson TC using the OEM-supplied magazine, and also using (a) a 7-round Colt magazine with GI-style flat follower, from Brownells; (b) a 7-round Check-Mate magazine with GI-style flat follower and “hybrid” feed lips; and (c) a 10-round Chip McCormick Shooting Star magazine with McCormick’s Devel-style follower and “wadcutter” feed lips. During the preliminary function testing we weren’t trying hard to miss the targets, but we also weren’t trying for maximum possible accuracy. 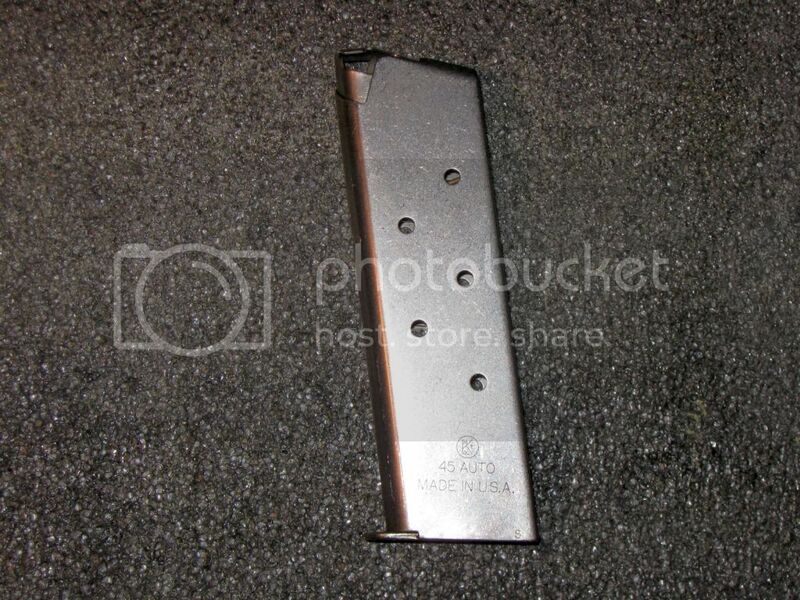 To be sure, all shots were aimed … but we were also being mindful of what magazine was in the pistol, and being on the look-out for possible malfunctions. Under those conditions, the informal results were very reassuring: Shooting my reloads, out of four targets we had three that kept everything within 2 inches and one that was barely over an inch—with several shots making a ragged one-hole group that made accurate measurement impossible. Results with Winchester USA and Cor-Bon DPX were about the same. For the accuracy portion of our testing we ran the targets out to 75 feet (the maximum distance possible at Chris’ Indoor Shooting Range) and fired a series of 5-shot groups from a seated position off a rest on the bench. We ran seven different types of ammunition through the pistol. After discarding the worst shot from each group, we measured the group size for the best four out of each five shots. The table below reflects the best group for each type of ammunition, and also the average of the best three groups. We encountered no issues or malfunctions during our accuracy testing. In fact, during the entire evaluation period with the Thompson TC we experienced only one malfunction; that was a failure to eject that occurred early in our testing. It didn’t happen a second time. We were favorably impressed by the Thompson TC. Although we recognized that this pistol is Auto-Ordnance’s flagship 1911, to be honest the price point didn’t suggest to us that we should have very high expectations. In fact, the pistol’s performance far exceeded our expectations and we are pleased that we can report that. In our estimation, the Thompson TC is a real sleeper of a buy for those looking for a high-quality, affordable 1911. Did we mention that the Thompson TC is manufactured entirely in the United States? For those to whom such things matter … it is. First, special thanks to Frank Harris and Marc Galli of Kahr Arms/Auto-Ordnance for making the Thompson TC available to us for review. Some of the ammunition used in the course of our testing was graciously provided to M1911.ORG by Winchester, Hornady, and Cor-Bon. Thank you all for helping make these tests possible. As always, we are especially grateful to Chris Dogolo and Mike Rubino at Chris’ Indoor Shooting Range for their assistance and cooperation in allowing us the use of the range for testing.